History: In 1781 Clement Topliff received permission to build a grist mill. His son, Cyrus, built a saw and grist mill in 1818 and later became the site of a silk mill, woolen, fulling, and carding mill, as well as button factory. Topliff also had a cider mill and a brandy still which where located remote from the mill site off Mason Road. Accompanying continuing changes in products, owners and operators, there were a number of significant physical changes made to the main mill site. In 1825, Topliff added a mill to process wool and in 1834, the Topliff carding and fulling mill was transferred to Thomas Dale. From then on the mill and surrounding area was known as Daleville. Thomas Dale’s first new building in 1840 was for the newly formed Willington Silk Company. (1840 to 1873) His silk mill provided opportunity for many home businesses to supply the mill with silk. 1873, James Hoyle, a native of England, purchased half interest in the Daleville Woolen Mills and by 1875 Hoyle and his partner, Smith, took over operations of the Daleville mill. By 1878 Smith dissolved his partnership with Hoyle at Daleville leaving Hoyle to continue the business on his own. This set plans in motion to increase the supply of water to his mill and laying the foundation for a water rights law suit. 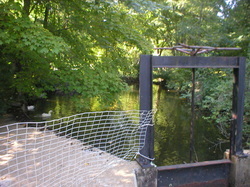 Hoyle, in his attempts to store more than his fair share of water from the Fenton River, found himself the subject to a water rights law suit by Charles Mason of Mansfield in 1885. Mason was joined by two silk mill owners E.B. Smith and William Williams who also were impacted by Hoyle’s greediness. Some of the most prosperous years for the business were under Hoyle. In 1900 James Hoyle sold the Daleville mill to Dennison Walker, another native of England. In 1902 Simon Sconsky of Philadelphia replaced S.S. Welch as the new manager of the Daleville woolen mill which operated under the name of the Willington Woolen Co. Walker continued to operate his woolen mill until it came on hard times and closed in 1904. In 1907 John Devorsky, bought the Daleville Woolen Mill located at the old saw mill site from the Commercial Farmer’s Bank, Baltimore, MD and established a business to produced buttons. Devorski made a number of improvements and in 1922, a new Daleville dam was built to replace the old one. Divorski sold the business to Anton Hak in 1925 who in turn sold it to Mr. Rifkin. Anton Hak was also known to have operated a button factory earlier between 1910 and 1912. While Hak’s early site is unknown, there is some speculation that it may have been at a small shop on the northerly portion of the Daleville mill site. Two remote ocean pearl spoil sites are located at the Daleville site raising those suspicions. Rufkin renamed the organization, the Daleville Button Corporation. After it had a three year interruption of operations during the depression, Rifkin closed the business in 1941 when the importation of shells from the South Pacific Ocean ceased due to World War II. Most of the ocean pearl button factories operating at that time closed for the same reason - loss of product. Although early records are sketchy, other millers at the site were John Brigham, most likely the earliest miller at the site; Ebenezer Heath in 1764; Ransom Kingsbury in 1825, William Froggertt in 1837. Site Characteristics: The remnants of the Daleville mill are some of the most well preserved of the old mill sites in Willington, but few if any remnants of the old saw mill exist. The saw mill used a narrow flume or sluiceway to direct the water to an undershot wheel driving an up and down or pittman style saw. 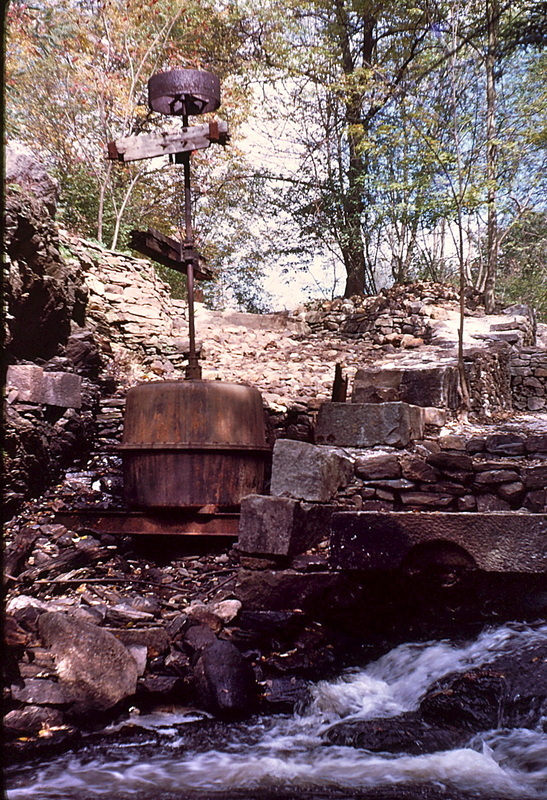 The sluiceway increased the power to the undershot wheel by increasing and concentrating water flow, thus giving it more power than an undershot wheel in the river could provide. The grist mill on the other hand was an overshot wheel. The Daleville remnants include the dam, a long sluiceway, the old overshot wheel pit, the wheel pit converted to a turbine power wheel pit, the turbine, and the building remnants.